The volatile seas around the South Pacific islands have caused grief yet again. 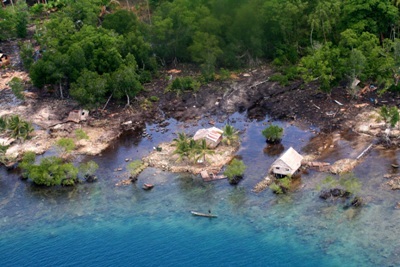 A strong 8.0 magnitude earthquake hit near the Solomon Islands on February 6,2013 and powerful waves have washed away over 100 houses, causing death and injury. At least four people have lost their lives and tsunami warnings were sounded in Australia and New Zealand as well, however they were later cancelled. According to reports, at least 4 people have lost their lives in the tragic event, as the low-lying Solomon Islands bore the brunt of the natural calamity. The community of Lata was the worst affected and World Vision said that water and electricity are not available in the area. Most people have moved up to higher land, but there have been reports of people in fishing boats being swept off to sea. Tremors continue to be felt in the area and the water has not yet receded from Lata. Barry Hirshorn, who is a geophysicist with the National Weather Service in Hawaii said that the potential for the earthquake to cause major damage was higher due to the fact that it was near the surface. The sea floor moved up or down in this case, causing a ‘thrust earthquake’, which led to a potentially dangerous tsunami being created.